Are you interested in our product, but you have a pet or two at home? It’d be perfectly normal to worry about their reaction to our artificial grass, especially if you’ve never had experience with it and it seems quite alien with you to begin with! We always find that caring pet owners put a lot of thought into whether or not the feel, smell and look of the artificial grass will be a big hit or an unfortunate miss, but you don’t have to be left wondering in the dark! We here at Great Grass have all the answers you need, all you have to do is read on! There’ll be no problems inside the house of outside of it, as animals are guaranteed to find your artificial lawn a soft and enjoyable experience. You’ll find them playing on it just like they would any other natural grass, rolling around and running with big smiles on their faces. Thankfully, however, you’ll be saying goodbye to the less stellar parts of owning a pet such as their uncanny ability to pick up mud and carry it into the house! Artificial grass is clean, free draining, and incredibly easy to maintain. Your pets will be able to play on it all year round and at any point in the day, as you’ll never have to worry about keeping them away whilst you mow the lawn or lay fertiliser as you would have to do with the natural alternative. It won’t freeze over, either, so say hello to those winter months with open arms and a well-prepared garden! Does that sound like just the thing for you? Why not give us a ring? 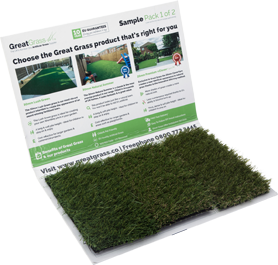 Here at Great Grass, we’re the largest artificial grass suppliers in the UK, providing top quality commercial artificial grass at cheap prices you’ll hardly believe. If you’ve been looking for artificial grass for dogs, cats or other household pets, then don’t hesitate to get in contact as soon as you can! We’d love to hear from you, and we’ll be able to share any knowledge or advice if you need it!